What Is The Best Workout For Building A Huge Back? What is the best workout for building a huge back? Find out what our forum members have put together. Get the latest exercises and workouts including anatomy descriptions and tips to take your back growth to new levels! A strong back plays a big role in strength and can give the appearance of a bigger and wider body. What is the best workout for building a huge back? Be specific. How should the upper and lower back be trained differently? Bonus Question: What bodybuilder has the most complete package in the back department? 1st place - 75 in store credit. 2nd place - 50 in store credit. A massive back is one of the hallmarks of a powerful physique, especially given the difficulty in training it. Unlike the chest, its classic counterpart, the back is composed of many muscles, each with a unique function and requirements. The back, as a whole, is composed of the following muscle groups: erector spinae, latissimus dorsi, rhomboids major and minor, teres major, posterior deltoids and trapezius. Some of these muscles are often considered parts of other sections (usually shoulders or core), but they are all technically part of the back. These muscles can be broken up into a few categories for training purposes. The back can essentially be divided up into three parts: lower, upper and trapezius. The lower back is responsible for the extension of the hips and spine, and is a key component in core thickness. The upper back can be broken up into two categories for training: width (lats) and thickness (posterior deltoids, rhomboids). The trapezius adds neither width nor thickness to the back, and is often trained with the shoulders. Based off of the information from above, it is clear that the back is a difficult body area to train, especially given the difficulty with visualization and mind-muscle connection present with the back. Thus, the back workout must be comprehensive without leading to overtraining. Let's start with the lower back. The erector spinae is responsible, as the name suggests, for the extension of the spine. However, classical fitness dogma teaches us right away that the spine must never bend while lifting weights, for fear of damaging it. This brings us to the secondary purpose of the erector spinae; the extension of the hip (along with the gluteal muscles and the hamstrings). The best exercise for building the lower back is, of course, the deadlift. The deadlift is a heavy compound exercise that will stimulate the release of growth hormones, and force the back (and whole body) to grow. 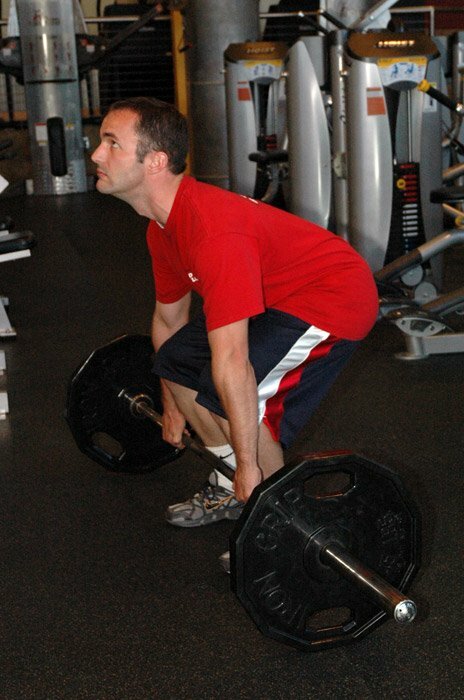 There are many different types of deadlifts, the two main types being regular (bent legged), and stiff-legged. 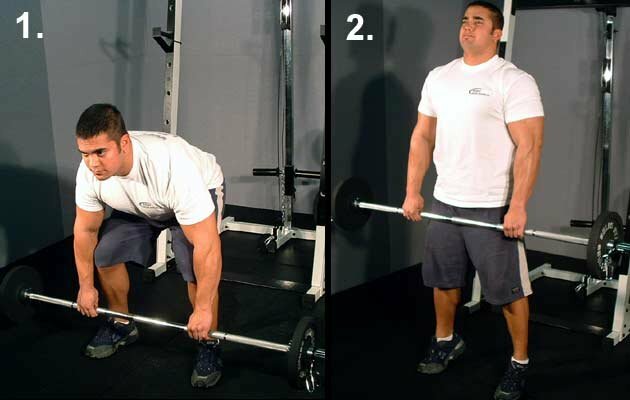 Bent-legged deadlifts allow for a greater range of motion, but are harder to keep in perfect form, as the tendency is to bend the legs early to take stress off of the lower back. 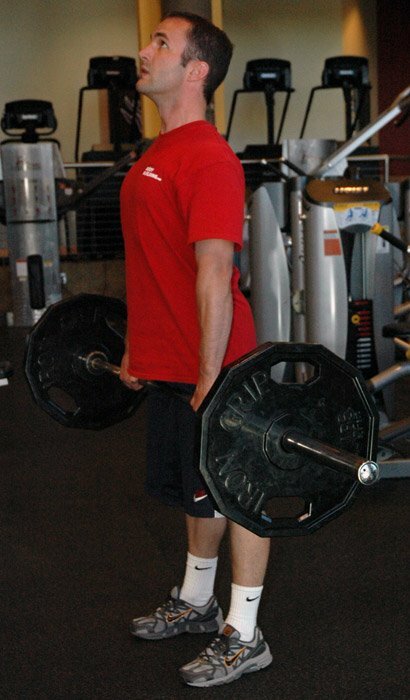 I would recommend stiff-legged deadlifts until the form is perfected, and then a switch to regular deadlifts. 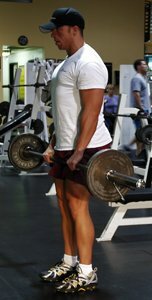 Hyperextensions are very similar to deadlifts, but are better for building definition than size. Include these for some extra intensity. The lats, rhomboids and teres major often work together, and can be trained with some of the same exercises. The lats are the largest and most important of these muscles, and thus require the most work. A complete workout for the upper back will include both isolation and compound exercises, as follows. 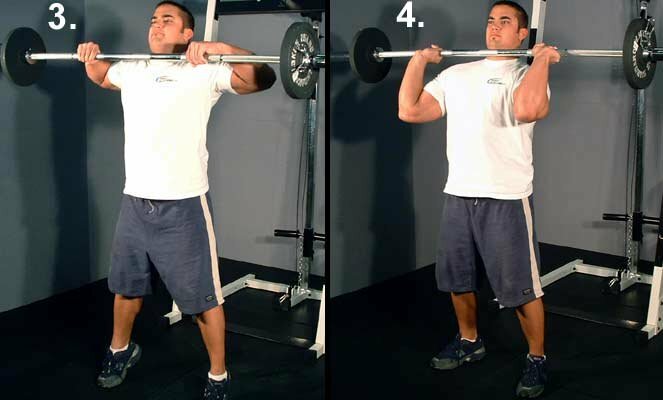 In my opinion, the best exercise for building the back is the power clean. It works the posterior chain, upper back, shoulders, traps, etc. Since it is a full-body exercise, it will also stimulate the release of growth hormones. Power cleans rely heavily of explosive power, which helps to build Type II muscle fibers, which are larger and have a greater potential for growth. Start with a couple of rest-pause sets of power cleans. Do 8-10 reps, rest 20 seconds, do as many reps as possible, rest another 20 seconds and do as many reps as possible. This is one set. After that, it's time for some rows, which also engage the whole back. Pulling close to the navel (like in the bent-over barbell row) in the rowing exercise will minimize the involvement of the deltoids and elbow flexor muscles, and focus on the lats and rhomboids. Since there is already a great deal of work for the lats in this routine, I would recommend dumbbell rows for a better-rounded workout. Next come Vince Gironda-style pull-ups. These are the best way to work the lats. Keep your shoulders pulled down and back, and pull to the lower pectoral line. This will allow for a full contraction of the lats, which will stimulate growth. This is what Don Howorth did to get his massive lats. Finally, do lat pulldowns, which never allow the muscle to rest during a set. This will force blood to be excluded from the muscle, and when the tension is finally released, blood will rush in to compensate, creating a massive pump. Finish this with a drop set to extend the time under tension. All that's left are the posterior deltoids and the traps. Since these are trained indirectly by deadlifts, rows, cleans, etc. little work is actually required for growth, and to prevent overtraining. Rear flyes for the deltoids and shrugs for the traps should finish off the back. Other shoulder exercises plus. . .
Click Here For A Printable Log Of Lynx_Lightning's Shoulder Day Workout. Click Here For A Printable Log Of Lynx_Lightning's Legs Day Workout. Click Here For A Printable Log Of Lynx_Lightning's Back Day Workout. And remember, mind-muscle connection and stretching are essential for muscular growth. Concentrate on feeling the muscles contract at first, before moving to heavy weights. Try to flex your back (it's difficult at first). Stretch between sets or after the workout to enlarge the fascia and create room for growth. One last note: a wide back is no good without wide shoulders and a trim waist to go along with it. Don't neglect the middle deltoids (lateral raises and military presses) and abdominal exercises with cardio. This will build an illusion of a back even bigger than it actually is. The lower back requires fewer exercises than the upper back, because it has fewer muscles. It is also difficult to train the lower back in isolation, as it almost always works with the gluteus and hamstring muscles. In general, however, they are made of similar types of fibers, and need similar types of training. On a practical note, endurance is more important for the lower back than the upper back, as normal everyday lifting activities heavily engage the lower back, which tires much more quickly than the surrounding muscles. What Bodybuilder Has The Best Package In The Back Department? I would have to say that Don Howorth has the best back development of any bodybuilder, past or present. His lats are absolutely huge, and like everyone who trained with Vince Gironda, he had a thick, defined back. The staple of building a huge back comes from thestandard pull-up with hands pronated (overhand grip). This gives your back muscles, primarily the lats, the greatest stimulation if performed correctly. Correct form means controlled movement that avoids momentum with the chest open and shoulder blades depressed. You can do all the back exercises in the world but if you can't do regular pull-ups correctly then you might as well go home. But seriously you won't see a solid back routine that is lacking pull-ups or lat pulldowns. The truth is the average person is highly unlikely to perform standard pull-up for reps, let alone sets of 12-15 with strict form. Of course I am talking about the world population in general, not just your average meathead. The key is to work up to it. Set realistic goals to build your upper body strength to that point. You may be only able to complete 4-5 quality repetitions at first and that is alright. Take a quick 30-90 seconds to recover then complete 4-5 more reps. Work up to the point where you complete the total number of needed repetitions for your training program. The average total number repetitions for hypertrophy is around 36-to-45. Keep that in mind as you perform these low rep sets an make it your goal to make it to that total number. One other option in lieu of bodyweight pull-ups is the assisted pull-up machine. There are many out there in modern gyms that provide the same function. The more weight added the more assistance provided. Take your bodyweight minus the number of pounds assisted and that is how much you are lifting. (if you wish to assume behind the neck pull-downs proceed with caution as this causes undue stress to the shoulders/tiny muscles of the rotator cuff). Again assume a wide-grip pronated hand position and ensure the chest is open and shoulder blades are depressed during the down phase of the movement. Lean back slightly, bring the bar down (almost down to the upper chest), pause at the bottom of the movement and squeeze your lats and then bring the bar back up in a controlled fashion. Keep constant tension on your lats by bringing the arms back up until there is a slight bend in the arms, then immediately bring it back down to the lowering phase. When you are able to perform standard bodyweight pull-ups with ease you can use a weight belt with a chain to increase resistance or use heavier weight on the lat pulldown. Keep in mind that a supinated grip (underhand grip) allows for greater biceps involvement, thus creating less resistance against the muscles of the back. A close grip whether supinated, pronated or neutral grip will use more of the muscles of the middle back. where one hand is supinated and one pronated. These types of changes in your routine will add variety and muscle confusion. All in all the standard pull-up (which the hands are greater than shoulder with) is the hardest variation because it requires the most back muscle involvement and should be the standard in a routine if you are unable to do them right. In order to gain full development of the back, your routine must target the upper and lower back separately. This is the same principle as targeting the lower and upper abdominal regions. But another factor that plays a roll in back training is width and thickness. There are a lot more muscles that are involved in back exercises than meets the eye. In order to best develop the back a person must understand it's anatomy. Easily the largest muscles include the latissimus dorsi, upper/lower trapezius and erector spinae. Some of the smaller muscles that are hidden underneath these major groups are the infraspinatus, teres major, teres minor, rhomboids major and rhomboids minor. So to break it down the latissimus dorsi muscles along with the smaller muscles of the shoulder girdle will build your upper back width. The lower and middle trapezius muscles along with the rhomboid muscles build you upper back thickness. Lower back width includes the lower lat region which are stimulated with some of same types of pull movements included in upper back width exercises. Finally, lower back thickness includes the erector spinae muscles and the muscles deep down that support the spine. Here is a breakdown and the exercises involved that will target the muscle groups to create that separation in the lats and middle back and Christmas tree like formation in the lower back. For upper back width (as stated in question 1) standard pull-ups or wide grip lat pull-down provide the greatest stimulation. The wider the grip the greater the stress on the lats creating the width of your upper back. using a lat pull-down bar with a wide pronated grip are also key to producing width in the back. will stimulate more bicep femoris involvement thus making it easier for your lats. (v-bar). With the neutral close grip of the V-bar this will target more the middle back or middle and lower trapezius muscles along with the lats. Ensure your form is regulated, avoiding letting the shoulder roll forward and leaning back to far using momentum to pull the weight back. With the chest out, shoulder retracted, pull solely focusing on your back muscles doing the work. Imagine squeezing your shoulder blades together while pulling the V-bar to the sternum or xyphoid process. For lower back width, the same exercises for upper back width are included. These mass builders should be performed: 1-arm dumbbell rows, barbell bent-over rows and T-bar rows. Again common errors for these exercises include the shoulder rolling forward. Stick your chest out, back straight, shoulders retracted (back and tight) and pull with a sole focus on contracting the lats. For T-bar rows, there maybe a chest pad to help stabilize you or not but the same principles apply. Another exercise to isolate the lats, to get that insane width is the straight-arm pulldown. is the bread and butter exercise. This will in fact provide a total body workout because it utilizes the shoulders, arms, trunk, hips, leg muscles to provide additional stabilization. The main workload goes to the tiny muscles of the lower back such as the erector spinae and quadratus lumborum. Back extension machines do the job for these lower back muscles are in my opinion less effective as it is an isolation exercise. 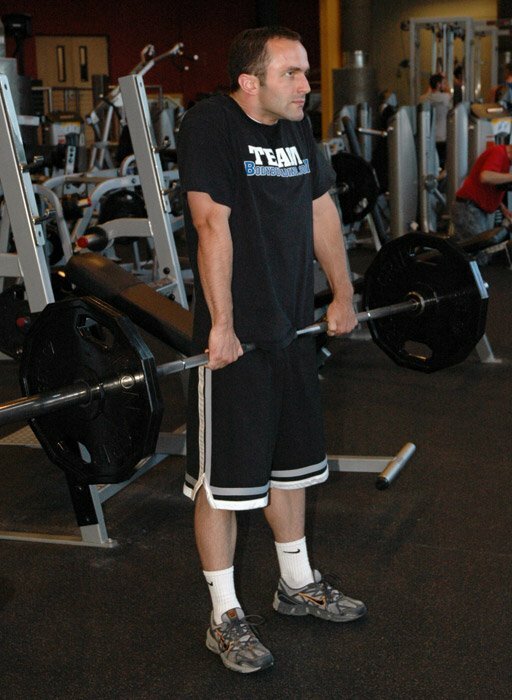 A variation of the deadlift is the stiff legged barbell deadlift. This puts more stress on the lower back since your legs are slightly bent but remain stationary. Also placing a barbell with lighter weight on your shoulders/traps you can perform a stiff legged barbell good morning.
. The key is to protect your back by maintaining strict form. Avoid rounding out the back and use a weight belt when handling heavier weight (315 lbs +). When in a strength training phase perform 6-8 reps (3 to 5 minute rests between sets) and when in a hypertrophy training phase do 12-15 reps (30 to 90 sec rest between sets). The routine will focus on each of the upper and lower width and thickness of the back. Choose the exercises you believe your own muscle anatomy needs. Everyone has their own likes and dislikes about certain exercises. Use the principle of priority rule. For example, if you are lacking in width, then choose a width exercise and do them first while you are fresh. You will need at least one of each of the following categories. 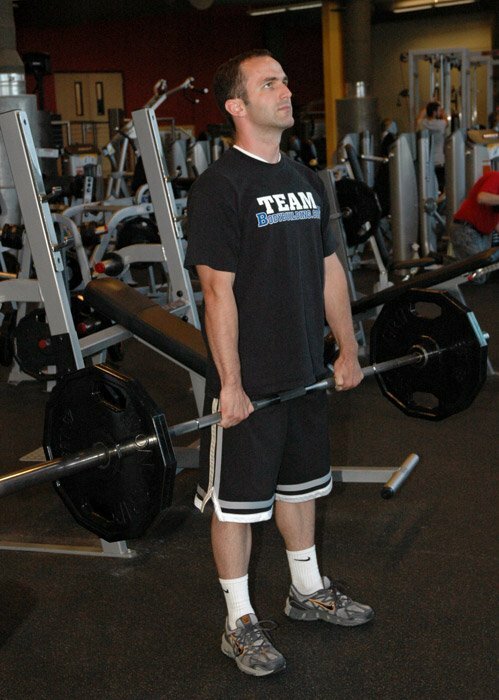 Save deadlifts for last because if you do them first or in the middle of your routine you will be sorry since this exercise uses the most testosterone and will use the most energy to perform, this is just a suggestion of course. Click Here For A Printable Log Of AFFormID10T's Upper Back Width Workout. Click Here For A Printable Log Of AFFormID10T's Upper Back Thickness Workout. Click Here For A Printable Log Of AFFormID10T's Lower Back Width Workout. Click Here For A Printable Log Of AFFormID10T's Lower Back Thickness Workout. I feel that 6-time Mr. Olympia, Dorian Yates had the most complete and impressive back in bodybuilding history. Hitting the rear lat spread, you can see his simply amazing massive development of the middle back (lower and middle trapezius) and lats. So huge. This guy was most definitely walking through doors sideways.